--Taking unique design, our edison bulbs with amber glass and squirrel cage filaments show perfect lighting effect for your lamp or room. --With CE&Rohs certification, the vintage light bulbs are safer and more eco-friendly than other bulbs on the market. --These bulbs are dimmable, you could enjoy the brightness changing from dim to bright with a compatible dimmer switch (but dimmer switch is not included). --To ensure that you receive the intact bulbs, shatter proof package especially the blister package is used to protect our bulbs well during transportation, no worry about receiving the broken bulbs. --Have been tested through over 3,000 hours lifespan, our edison bulbs would save your time, money and energy to change them. ◕‿-｡Please search "Elfeland light bulb" for more related items. 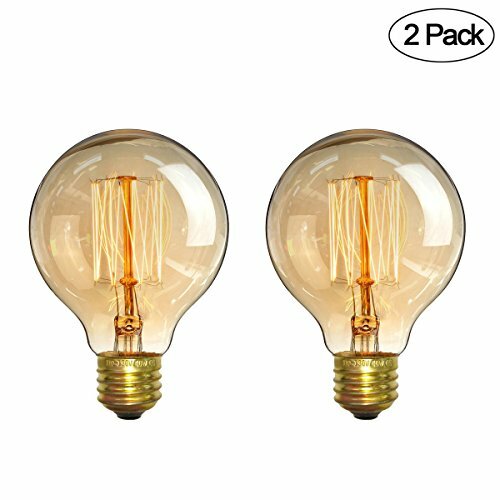 ◕ UNIQUE DESIGN: An alluring vintage squirrel cage filament design and amber glass shell make the edison bulbs more attractive and antique than ordinary ones. ◕ SPECIFICATION: 110V / 60W / 2300K / 337 LM / CE&RoHS certified / fit for E26 or E27 base / amber glass / dimmable with a compatiable dimmer switch (not included). ◕ USE FOR: Suitable for pendant lighting, wall sconces, indoor or outdoor. Typically used for home or commercial decoration, kitchen, living room, bedroom, bar, coffee shop, restaurant, etc. ◕ CUSTOMER FIRST: We value every customer, and if you are unsatisfied with the order, please feel free to contact us, we will try our best to make things right! If you have any questions about this product by Elfeland, contact us by completing and submitting the form below. If you are looking for a specif part number, please include it with your message.